As I write, an extraordinary and symbolic protest is taking place under – and apparently in – the branches of an elm tree in central Brighton. Brighton and Hove’s Green administration has embarked upon a major and hugely welcome redesign of one of the city’s least loved junctions – the Seven Dials roundabout, a traffic hub in which traffic crosses from sundry directions. It’s unsightly and dangerous – especially for pedestrians and cyclists – and the fact that the Green administration has got to grips with a problem that previous administrations have chosen to ignore can only be welcomed. Whatever the fate of Brighton and Hove’s Green administration, there is little doubt that one of its big legacies will be a range of transport schemes that have firmly shifted the balance in favour of pedestrians and cyclists, and rightly so. Unfortunately, in Seven Dials, there is collateral damage. The scheme as agreed involved the cutting of a magnificent healthy elm tree at the top of Vernon Terrace. It is that tree that has become the focus of protests. Local people collecting signatures have been joined by Green MP Caroline Lucas and some of Brighton’s seasoned Green activists have been actively involved in defending the tree. Some have climbed it – including veterans of the recent Coombe Valley protests against the A27 Bexhill by-pass. The concept of Green activists protesting against a Green council’s proposal to cut down a tree to facilitate a traffic scheme – even one as welcome and fundamentally green as that in Seven Dials – would be in any event farcical. But there are other issues in play that compound the problem. First, this is an elm tree – and elms are of particular importance in Brighton and Hove. When Dutch Elm Disease set in across England in the 1960s, it was visionary and decisive action by the town’s arboriculturalists that ensured that Brighton was shielded from the disease; doing so involved a drastic programme of cutting trees pre-emptively but the result was that Brighton has one of the largest collections of mature elms in the country. For many of us, a mature elm tree is one of the most powerful symbols of Brighton, and part of our collective heritage. The simple fact is that these trees matter to people in the city. Diseased elms are cut down occasionally, and although people are saddened by the necessity everyone understands why it has to be done. But this is a healthy elm. Morevoer, the tree is – just – inside Regency ward, represented by the Council leader, and close to the boundaries of two other key Green-held wards (Goldsmid and St Peter’s). A decision that has managed to alienate key supporters across three wards looks like bad politics at a purely party level as well. The point is that implementing the Seven Dials scheme would have been a huge win for the Green administration; a sign that it can deliver against a horrific fiscal background. It looks awfully as if it has blown it. The arguments for cutting the tree are that it will obscure sight-lines on the approach to a pedestrian crossing; that the roots are breaking up the road and pavement surface, the latter causing problems for passing pedestrians and in particular buggies and mobility scooters. The Council argues that the issue was covered in the consultation, but campaigners claim to have been unaware of the loss of the tree. None of these points is of itself invalid – but these look like the arguments of officers, not politicians. And moreover, consultations – valuable and important though they are – are no substitute for political judgement and sensitivity. It does seem astonishing that the implications of taking this tree have slipped under politicians’ radar, to the point where the most prominent Green politician in Britain, Caroline Lucas, finds herself being interviewed in front of a tree that she’s defending from her own Green-led local council. It’s already a situation in which the Green administration has been damaged. The spectacle of a Green-led council forcibly removing its own activists from a tree before cutting it would destroy the administration, and probably Caroline Lucas’ prospects of re-election. Finding an alternative is a condition for the administration’s political survival. It’s also horribly damaging for the Green Party as a whole. But there are more fundamental questions about what happens when Greens – or any other group trying to challenge the hegemonic values of our political culture – obtain office (especially in where that administration is in a minority). It shows the desperate importance of (excuse the pun) remaining in touch with your roots, and not allowing your natural political instincts to be thrown off by the demands of office. There are fundamental strategic issues here that Greens in Brighton and more widely must consider very carefully. If the Green administration in Brighton and Hove can reconnect with its roots, it could emerge stronger from this. 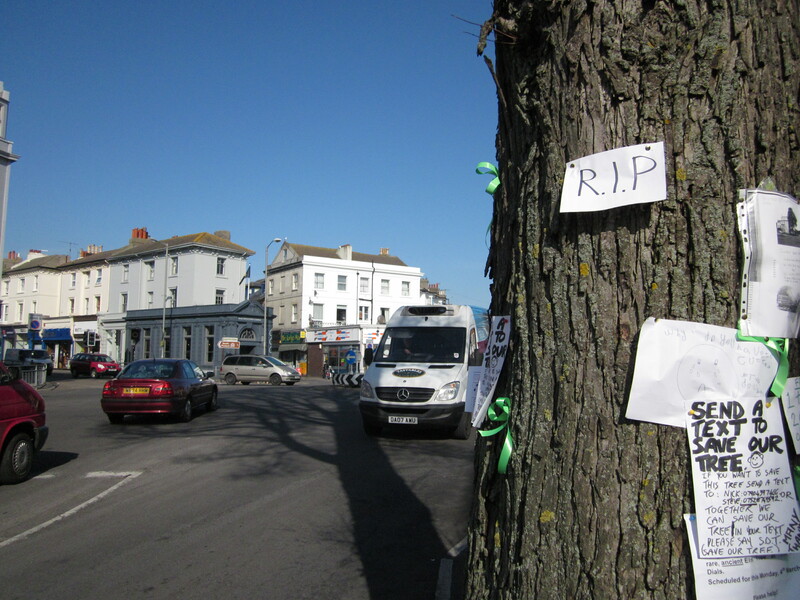 But in many ways this is the most important test it has faced, and the fate of one much-loved elm tree could seal the fate of Brighton’s Green administration and hugely damage the Party as a whole. This entry was posted in Brighton and Hove, Green, Transport Policy and tagged Brighton, Brighton and Hove City Council, Caroline Lucas, elm tree, Seven Dials Roundabout, Vernon Terrace. Bookmark the permalink. « Brighton and Hove Budget day thoughts – What have the Greens ever done for us? brilliant piece thanks. we must fight tooth and nail to save this Elm. cutting it down is insanity. It was 100 years of life left at least. This tree could be the downfall of the Greens. I won’t vote for them locally if they cut it down. never. written too fast sorry! it HAS 100 years of life left at least… and I meant this could mean the downfall for the Greens locally. I spoke to at least 200 people while getting signatures for the petition, and many said if the tree goes so does their support of the greens in Brighton.